In general, most garden birds show three peaks to their levels of feeding activity during a typical winter's day. The first of these occurs during the early morning and is thought to be an attempt by individual birds, emerging from their roosts, to top up energy reserves lost the previous night. A later peak, occurring towards the end of the day, probably has a similar cause, with birds taking on extra reserves to help get them through the night ahead. 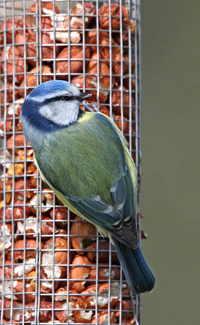 The absence of birds at garden feeding stations in late morning and early afternoon suggests that small birds are balancing the risk of predation against the benefits gained from energy-rich foods. There is a third peak, smaller in size, which occurs during the middle of the day. This peak does not fit with the predictions made by predation-risk models but may be a consequence of competition between individuals for access to limited food reserves. The smaller, subordinate species (and individuals - e.g. juveniles) may be forced to visit feeders at a time which is not ideal because more dominant species (and individuals) exclude them from the feeders at the better times of day. One other complicating factor in all this is the predictability of the food supply. Most garden feeding stations represent a predictable food supply, so birds can rely on being able to top up their fat reserves late in the day in readiness for the night ahead. This means that they do not have to feed continuously and hence carry around extra fat reserves all day, which may make them less manoeuvrable and more readily caught by a predator. Research has shown that, where food supplies are less predictable, small birds will increase their energy reserves at the earliest opportunity, presumably because the risk of starvation will be higher than the risk of being predated.